The CoffeeShop Blog: CoffeeShop "Magic WebBoard #2 Square" Photoshop/PSE Action! CoffeeShop "Magic WebBoard #2 Square" Photoshop/PSE Action! The countdown to Christmas is on! I usually have most of my shopping done by now, but this year I am completely behind and just started getting some gifts yesterday. Thank goodness the boys still like Legos or else I would be completely at a loss of what to get them. Everyone else is getting handmade beauty products like soap and lotion. Today I have a brand new professional storyboard Photoshop/PSE action I wanted to share with you. This action builds a 1000x1000 pixel square storyboard, perfect for your website/blog/facebook/etc. It prompts you to load four images then creates a finished storyboard with and without borders. You simply turn on the version you want to post and flatten and save. I have another Magic Board action that creates an 8x10 storyboard that you can download for free. I plan on writing a series of these storyboard-making actions, they make it so easy and fast to create beautiful and professional storyboards. 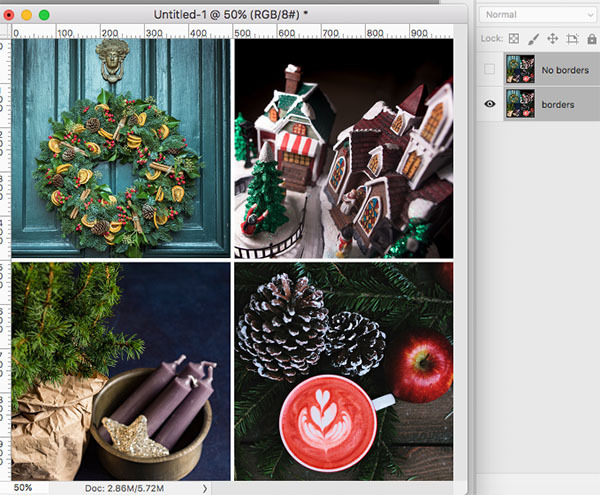 Images I used in this post: (wreath, gingerbread, candles, coffee). When you start the action make sure nothing else is open in Photoshop or PSE. The action will build this nice little storyboard and prompt you to load your images. Just drag each image where you want it and press the check bar. When you have loaded all images (starting with top left, top right, bottom left, bottom right) the action will automatically add borders and flatten both storyboards. You simply turn on the one you want and flatten and save and post! 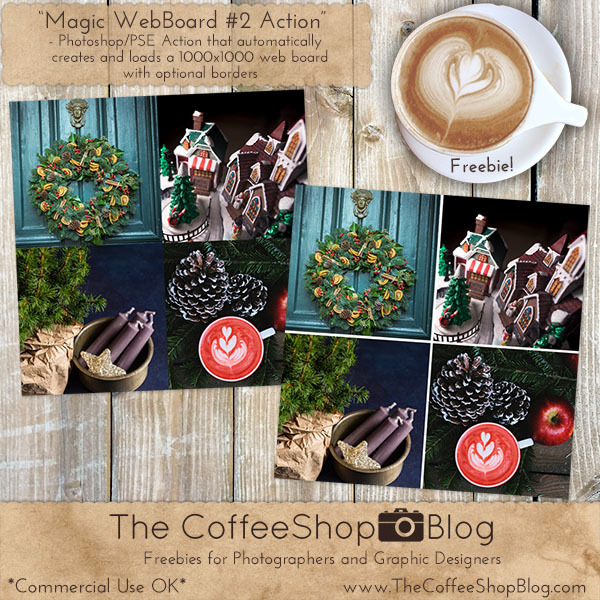 Download the CoffeeShop Magic WebBoard #2" Action. You can also download it here.